Well we made it past the weekend with a Yoplait House Party brunch (I'll post about that a little later), Halloween party in the middle of a severe thunderstorm, and a small group coupon class. I just asked Engineer what he would like for supper this week and he said Stroganoff so Stroganoff he shall have. 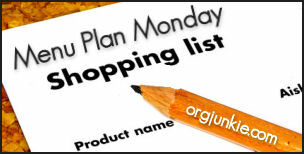 This menu plan is one of many over at Organizing Junkie's Menu Plan Monday.